Mirror photo by Walt Frank Anne Maleady (left) and Eric Brenner, members of the Sept. 11 National Memorial Trail Alliance, prepare to take off on their journey Tuesday morning from Canal Basin Park. HOLLIDAYSBURG — With the temperature just above freezing and light snow falling Tuesday morning, members of the Sept. 11 National Memorial Trail Alliance gathered at Canal Basin Park to continue their journey. “I promised them a four-seasons tour. The ride is spectacular. 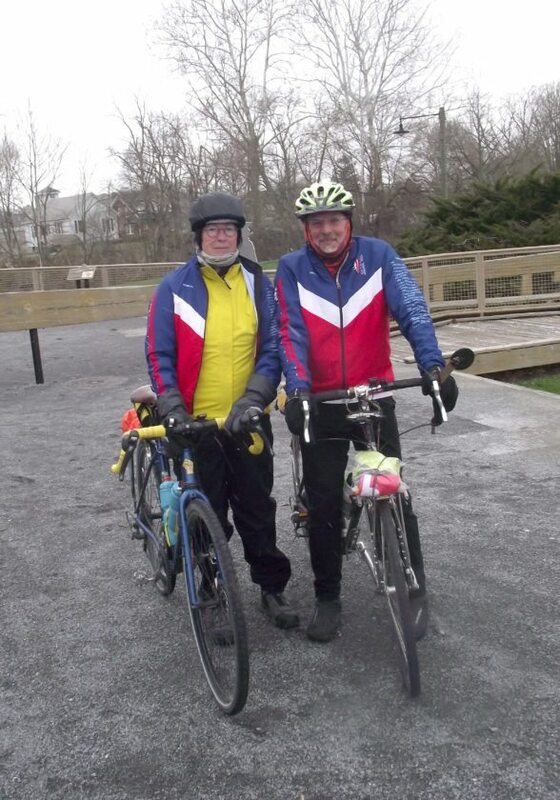 I am looking forward to our ride today,” said Eric Brenner of Silver Springs, Md., 911 Trail assistant board chairman and ride coordinator. “It is interesting — one day, you get sunburned and the next day, you are wearing everything you own,” said Anne Maleady of Durango, Colo.
A group of five riders spent the night in Hollidaysburg before heading out on day seven of their 23-day, 1,300-mile journey. The trip is the first complete bike ride connecting the three 9/11 memorial locations — New York City’s National Sept. 11 Memorial, the Pentagon Memorial in Arlington, Va., and the Flight 93 National Memorial at Shanksville. The route follows the current mapped route and is designed to increase awareness of the trail and support the local communities currently making improvements on segments of the alignment. The Lower Trail is part of the route. “The reason the 9/11 Trail visited here is because of the Lower Trail. It is a 17-mile off-road trail. It was a no brainer. It is a great trail to ride. It has added a lot to this region,” said Jane Sheffield, alliance treasurer. “We are excited that the Lower Trail is a segment of the 9/11 Trail,” said Karl King, alliance board member and vice president of Rails to Trails of Central Pennsylvania. The alliance’s mission is to spearhead the development of a 1,300-mile trail connecting the three memorial sites and communities as one. Maleady called it a great project. “It takes a tragedy and makes it into a living memorial. The enthusiasm of the local population has been amazing,” Maleady said. “This trail is about 47 percent offroad in total. That is significant today. Not many trails of this magnitude are that way,” said Andy Hamilton of Doylestown, alliance board chairman. “We see this (the 11 Trail) as another signature reason to visit Blair County. This could bring cyclists and others interested in heritage and culture into the area,” said Mark Ickes, executive director of Explore Altoona. “Outdoor recreation attracts people. When looking at the next generation, this is what they are looking for in terms of amenities. This is as important as business parks and rail. This is critical. There is a great synergy among the leaders in Blair County to make good things happen,” said Steve McKnight, Altoona Blair County Development Corp. president/CEO, who arrived on his bicycle wearing a ski suit. The journey, which began April 11 in Arlington, Va., will conclude May 3 at the Pentagon.